Where possible please submit via email in MS Word, PDF or JPEG. We appreciate that this is not always possible and are happy to provide assistance if required. NOTE: The proportion or ratio is the most important here; it may be easier for you to create your advert using the ratios given* rather the precise sizes and we will shrink or enlarge it as necessary. Single adverts – will be invoiced upon distribution of the magazine in which the advert is printed. Discounted rate adverts – all 4 adverts invoiced upon distribution of the 1st magazine in which the advert is printed. 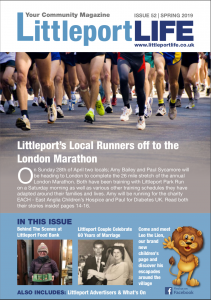 Cheques should be made payable to The Littleport Life Magazine.